Allan R. Bevere: The Third Council of Nicaea in 2025: Should Protestants Be Invited? The Third Council of Nicaea in 2025: Should Protestants Be Invited? 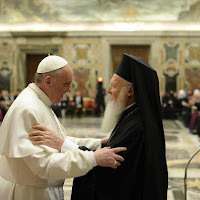 On a recent visit Pope Francis and Bartholomew, the Ecumenical Patriarch of Constantinople, have scheduled what will be the first ecumenical council of the church in centuries. It will take place in the ancient city of Nicaea, where two previous ecumenical councils were held. If the council does take place, it would be an unprecedented event in the modern history of the church. The question I have is will the various Protestant traditions be invited? Should those Protestant tradition that have declared that they are not creedal, meaning they have not embraced the ecumenical creeds as necessary statements of faith, be invited? After all, substantive ecumenism has to be about more than just a bunch of fragmented Christians getting together with nothing more than a sentimental love for unity shown by standing in a big circle holding hands and singing 37 verses of Kumbaya. As the late theologian and church historian, Jaroslav Pelikan reminded us, creeds function as constitutions that order a body politic (and the church is a politic). Jesus himself treated the Shema (Deuteronomy 6:4) as a creed. Creeds are necessary because, as Pelikan notes, "A code of moral conduct by itself--the Scout oath-- won't sustain you." So, will at least some Protestants be at the Third Nicaean Table in 2025? Do protestants have bishops to be invited? They may be invited as observers, as was the case in Vatican II. But I don't really see a point in inviting them if it's a talk between Catholics and Orthodox.